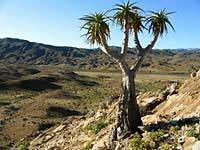 While many people already know about the Richtersveld National Park, few realise there is an equally large protected area to the south, previously called the Richtersveld Community Conservancy. This area is the last refuge of Nama people living what is known as the transhumance lifestyle - to migrate seasonally with their livestock from mountains to the river and so make sustainable use of the fragile succulent ecosystem. In recognition of this vanishing lifestyle, and of the rare botanical diversity it helps protect, the Conservancy has been declared the core of a new World Heritage Site - one of only eight in the South Africa. The WHS status follows initiative by the historically disadvantaged people of the Richtersveld who united to reclaim title to their traditional land, and set it aside as conservancy to be forever conserved for research and tourism. For a place to become a World Heritage Site, it must meet strict international criteria to establish that it is a site of global significance, a place of significance to the human race as a whole. For those who take the time to explore, the WHS offers some of southern Africa’s finest hiking, 4x4 driving, camping and cultural experiences. The emerging South-North Tourism Route (SNTR) initiative is a community-based tourism route that is being developed on the basis of equitable, sustainable and responsible tourism in conjunction with local people from the route. Most of the enterprises that make up the route were created in their entirity or in part with Social Responsibility funding from the Department of Environment and Tourism (DEA&T). The route divides into a number of subroutes (see map above) which stretch from Cape Town to !Ganigobes in southern Namibia and consist of grass roots tourism projects at various stages of development. The aim of this initiative is to establish a self-regulated tourism industry that will ensure that benefits accrue to local people. Thinking of going to see the flowers in Namaqualand? With the good rains that have fallen recently, this year may be one of the best ever! The West Coast between the Berg and Olifants Rivers offers superb hiking and cycling opportunities. The newly opened Crayfish Trail starts in Elandsbaai and follows the virtually uninhabited coastline as far as the Olifants River mouth, before turning upstream to Ebenhaeser, a historic settlement on the banks of the river. Experience one of the few regions on the West Coast with mountains, rivers and wetlands, long beaches and snow white dunes.